This is Wimpy's Page where you get to read my review of the Abit BP6 dual celeron motherboard. Wimpy is the latest addition to my computer family. Wimpy gives gigahertz performance from a five hundred dollar machine. This performance is hard to beat at this price. Several people have written to ask if I know of a driver for the UDMA66 controller on the BP6. All the drives in Wimpy are SCSI and I have not used either of the IDE controllers on the BP6. That said, I have seen drivers for the HPT UDMA/66 controller at Linux IDE site. I have wanted my own multi-processor machine ever since I worked on a Cyber 18-30 RJE station in grad school. I drooled over multi-486 machines when they were first available but they were too expensive. Multi-pentiums were likewise priced as server class machines. Finally, the ABIT BP6 brings multi-processor systems into the price reach of normal folk. Wimpy is being constructed using an ABIT BP6 dual celeron motherboard, a pair of Intel 400Mhz celerons and parts scrounged from other systems. He will be living in a SuperMicro SC750-A case purchased for this project. Wimpy will be the first ATX machine in my lab. I have been putting off the upgrade to ATX form factor machines as long as possible, but the BP6 provides the justification to change. Cases are cases and the BP6 finally offers a technology not available in AT format. I found a comparison between a dual celeron machine called the Nerd box and a dual 560MHz Pentium III called the god box at Ars Technica web site. Their comparison concluded that the MHz for Mhz, celerons were just as good as Pentium III's for desktop applications at a fraction of the cost. 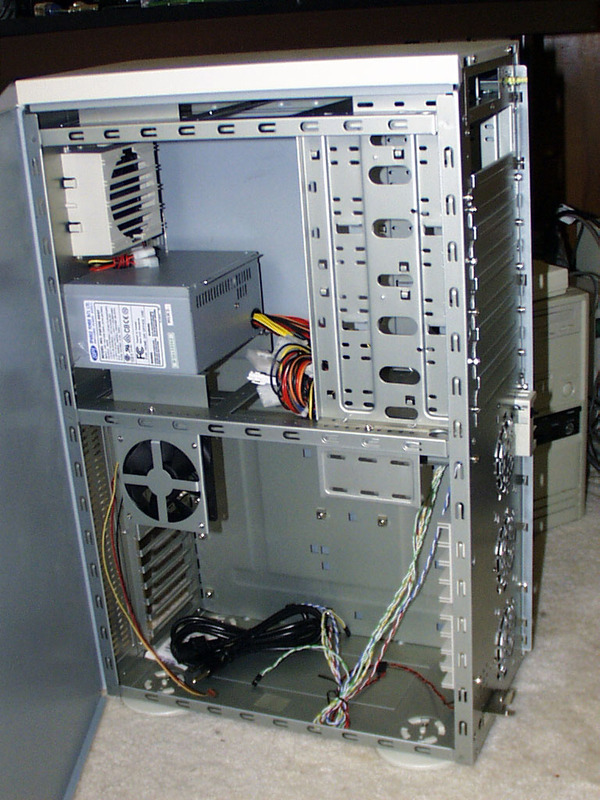 I purchased a SuperMicro SC750-A case for this project. At a hundred and fifty dollars, it is the most expensive single component in the system, but it looks like a case that will survive several upgrades. It may even keep my pile of old 5 1/4 inch full height SCSI drives cool. The only problem I have found so far is that it does not fit under my work table. 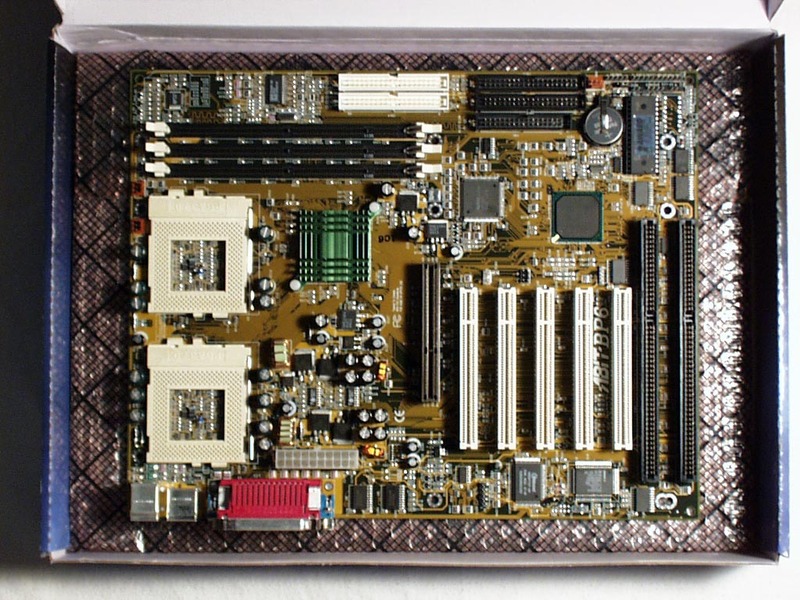 The motherboard and processors were ordered from Dynasty Express for $344.14 including shipping and handling. The BP6 was on backorder when I called to confirm the order but was shipped on the day they clamied it would. The motherboard and CPU's arrived right on schedule. UPS delivered them at 2:46 on Thursday 15-July-1999, one week after they left Dynasty's Alabama location. I arrived home at about 8PM and Wimpy was up and running by 10PM. The BP6 mother board is well laid out and was easy to assemble. Installation was straight forward as everything worked perfectly the first time. Linux 2.0.35 with SMP=1 set in makefile recognized both CPU's with no trouble. Unknown mass storage controller: Unknown vendor Unknown device (rev 1). Medium devsel. IRQ 11. Master Capable. Latency=120. Min Gnt=8.Max Lat=8. Ethernet controller: DEC DC21140 (rev 34). Medium devsel. Fast back-to-back capable. IRQ 10. Master Capable. Latency=32. Min Gnt=20.Max Lat=40. Non-prefetchable 32 bit memory at 0xe8411000. VGA compatible controller: Trident TG 9660 / Cyber9385 (rev 211). Non-prefetchable 32 bit memory at 0xe8000000. Non-prefetchable 32 bit memory at 0xe8400000. Medium devsel. Fast back-to-back capable. IRQ 5. Master Capable. Latency=32. Min Gnt=8.Max Lat=8. Non-prefetchable 32 bit memory at 0xe8410000. Bridge: Intel 82371AB PIIX4 ACPI (rev 2). Medium devsel. Fast back-to-back capable. IRQ 10. Master Capable. Latency=32. ISA bridge: Intel 82371AB PIIX4 ISA (rev 2). PCI bridge: Intel 440BX - 82443BX AGP (rev 3). Medium devsel. Master Capable. Latency=64. Min Gnt=128. Host bridge: Intel 440BX - 82443BX Host (rev 3). Prefetchable 32 bit memory at 0xe0000000. I believe the two unknown devices to be the UDMA66 controllers on the mother board. My first impression on the system is: WOW! The RC5 client checks 2.2 million keys per second with both processor active. Not too shabby for a $500.00 system. Just out of curiosity, I used the soft-cpu settings to see how things would run at higher speeds. I used manual mode to verify that everything ran fine at 6 x 66 MHz (the auto setting for 400) then increased the system clock from 66 MHz to 82 MHz. This gave an effective clock speed of 500 MHz. The system ran fine. Bogomips increased fo 492 and the RC5 client benchmarked in at 2.76 million keys per second. The processors did get noticably warm during this test and the system was returned to auto settings on the next reboot.